HAMDEN, Conn. - Tereza Vanisova's overtime goal gave a thrilling end to the Black Bears 2-1 victory over the Quinnipiac Bobcats Friday night. Vanisova's game winning tally with 1:34 left in extra time came on a rush in deep to blitz Quinnipiac in the slot and seal the closely contested game. The Black Bears (1-0-0, 0-0-0 Hockey East) opened the season on the road against Quinnipiac (0-3-0, 0-0-0 ECAC Hockey) and fell behind early as Lexie Adjiza scored 55 second into the second period. Despite trailing, the Black Bears pushed the pace of play and posted 28 shots on goal against, with 11 shots on in the third period. 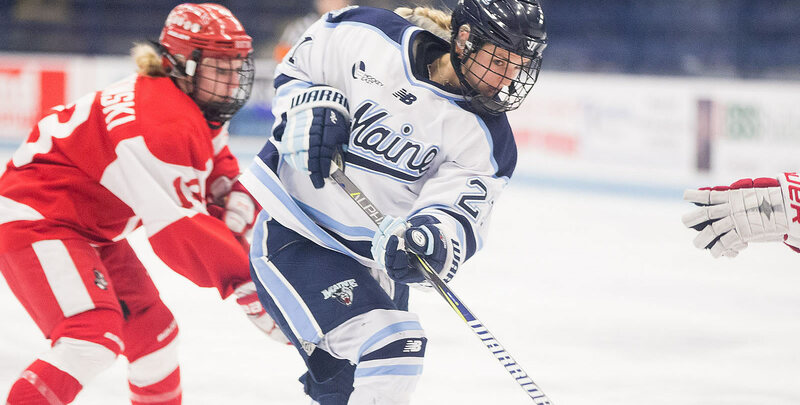 Maine held the Quinnipiac offense to 9 opportunities on Carly Jackson. Defense also locked down on special teams, going 1-for-1 on the penalty kill. Vanisova tied the game on a power play with five minutes remaining in the second on a nice feed from Ali Beltz, set up by Alyson Matteau. Helpers on Vanisova's game winner came from Celine Tedenby and Ida Press, good for their first collegiate points. The Black Bears were strong across the board, winning 24 faceoffs and blocked four shots while forcing the Bobcats offense to the outside with strong defensive presence. These two teams battle again on Saturday afternoon at 3 p.m. in Hamden to finish the weekend set.